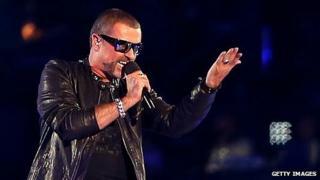 Singer George Michael has been airlifted to hospital with a head injury following a crash on the M1. A spokesman for Michael confirmed he had been involved in an accident on Thursday but said the singer only had "superficial cuts" and was "fine". Michael was a passenger in a Range Rover and no other vehicles were involved, the spokesman added. Connie Filippello, spokesman for Michael, said: "George Michael was a passenger in a vehicle involved in a traffic accident yesterday evening. No third party was involved. Ambulance spokesman Gary Sanderson said: "The man who we believe to be in his 40s sustained a head injury and following treatment, stabilisation and immobilisation by land and air ambulance crews, he was flown to hospital for further care." Hertfordshire Police said the northbound carriageway of the road was closed for an hour while emergency services dealt with the incident. Two people were in the car at the time of the crash at about 17:50 BST. No arrests have been made. A police spokesman said: "The exact circumstances of what happened are unclear at this time and until further investigations have been carried out it would be inappropriate for us to comment further." In September 2010, Michael was given an eight-week sentence for crashing his car while under the influence of cannabis. The singer was arrested in Hampstead, north London, after driving his Range Rover into a branch of photographic store Snappy Snaps.